Ms. Hughes is a tireless educator and cultural preservationist. She is committed to the traditional perspective and principles given to her by her family and elders. 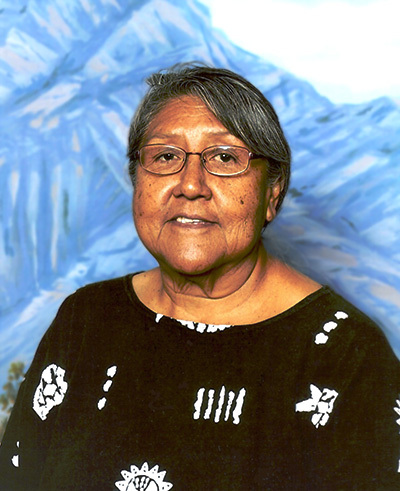 Ms. Hughes has been a humble leader in the cultural revitalization efforts for her tribe and she has been instrumental in her community’s language preservation efforts since 1999. Working as an educator, in 2007, she became the Gila River Indian Community’s first culture coordinator. As culture coordinator, and under the direction of then Governor, William Rhodes, Ms. Hughes was an important part of the effort to develop an alphabet system for her tribe’s language. In a 2005 interview conducted while she attended Arizona State University, Ms. Hughes comments, “Our language, our Himthag, is the number-one source of our soul, our pride, our being, our strength and our identity.“ Since earning her Arizona State University Bachelor’s degree in Elementary Education- Multicultural/Multilingual Education (2005), and University of Arizona Master‘s in Linguistics, Native American Language and Linguistic (2016), Ms. Hughes continues to work throughout her community teaching Akimel O’otham Himthag (“way of life”) and Akimel O’otham language. She is currently a Traditional Language Instructor, developing curriculum and coach of the culture program classes at Gila River Community Crossing School. Every year, the Heard Museum’s Board of Trustees, upon the recommendation of its American Indian Advisory Committee, honors with the Spirit of the Heard Award an individual who has demonstrated personal excellence either individually or as a community leader. The recipient’s nomination by the American Indian Advisory Committee is ratified by the Board of Trustees. The honoree is presented with the award during the Phoenix Indian Center’s annual American Indian Excellence in Leadership Awards dinner, which will be held on Tuesday, Nov. 14, 2017 at the Hilton Scottsdale Resort & Villas, 6333 N. Scottsdale Road, Scottsdale. Registration begins at 5 p.m., dinner 6 p.m. The awards dinner is a Native American Recognition Days event. Tickets to the American Indian Excellence in Leadership Award Ceremony are available through the Phoenix Indian Center website. Learn more and purchase tickets (this link takes you away from the museum website).